1. Marinate mutton, yogurt, garlic and ginger paste for at least ½ hour. 2. Heat the pan with onion, bay leaf, cardamom and cinnamon on medium and fry the onion till it becomes transparent. 3. Add marinate mutton, coriander and salt and cook it oil comes out. Stir occasionally. 4. Add milk, poppy seed paste and water and cook it till mutton becomes tender. 5. Add chillies, black pepper, sugar and clarified butter. Stir it and cook 2 more minutes. 6. 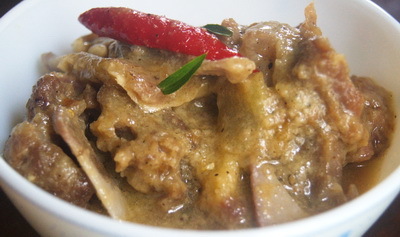 Serve hot mutton korma / khasir korma with polau rice. Apu, can I use black poppy seed for this korma or do I need to use white poppy seeds? Where can I get white poppy seeds- is it available at coles/woollies? You need to use white poppy seeds. White poppy seeds are available in Indian grocery. Instead of white poppy seeds you can use cashew nuts paste. Thanks. Thanks for the recipe. I cooked mutton korma for our lunch today & it came out really well. I followed all your instructions except for sugar – used half the amount. The taste of the gravy was heavenly! Thanks a lot ! What I should say, I have sugar tooth so I have used more sugar(may be)!! I am a fussy eater but I love my Mutton korma. Thanks for sharing your experience with my recipe.